When you purchase a Tivo or rent a Cable or Satellite DVR box the remote is part of the package -many times not even part of the decision. But when you buy or build your own Home Theater PC (HTPC) choosing a remote control can mean the happiness or dissatisfaction with your powerful HTPC system. The remote control is the unsung hero - many times a forgotten, but very important component of the HTPC setup. Because of the great deal of versatility the HTPC brings the user, a HTPC remote control really needs to be a jack-of-all-trades remote. A HTPC remote's job is very difficult since it controls TV, Movies, Music, Photos and more and ideally it should also control the television, receiver and any other AV equipment you use in your setup. Snapstream, the maker of Beyond TV has been selling one of the more popular HTPC remote controls, the Firefly remote control for several years now. SnapStream provided Team Zatz Not Funny the remote control for review so I have my hands on Snapstream's Firefly PC Remote Control made just for the HTPC. There are two versions of the Firefly, the original Firefly and the Firefly Mini. Today, we'll focus on the original Firefly. The Firefly is for sale at the Snapstream Store and retails for $49.95. 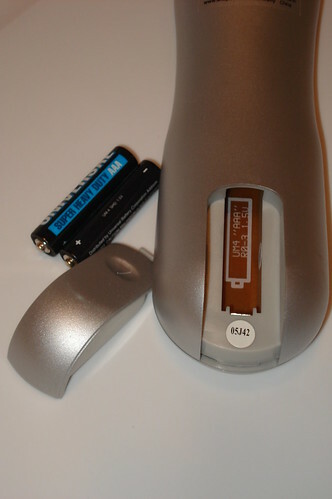 The Firefly remote is RF-based instead of most remotes that are infra-red. This means it works without needing line-of-sight to work like infrared remotes do. The advantage of RF is that it can work through walls, sofas, cabinets etc. The disadvantage of RF is that most other devices such as TVs, DVD players etc are set up to work with IR remotes and don't work with the RF signals that the Firefly uses - but we'll get to that later in the review. I tested this remote using my Home Theater PC that has SageTV, Beyond TV and Beyond Media programs installed on it and have also tested it with Media Portal, Power DVD and VLC to name a few. 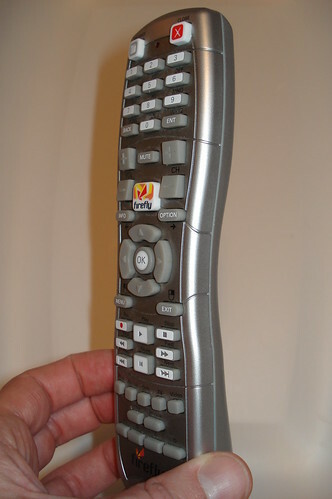 My primary test software was with BeyondTV though since that is the software made by the same company that makes this remote. You'll find the Firefly fits nicely in your hand. It measures just under 8" long, 2" wide and 1.4" thick. It looks fairly sleek and is silver in color. In person it has a toy-like look to me, but not so much it takes away from the appearance. The Firefly is pretty light - just under 5 ounces with the two AA batteries (included with the remote.) The batteries fit into a spot on the underside of the remote control. 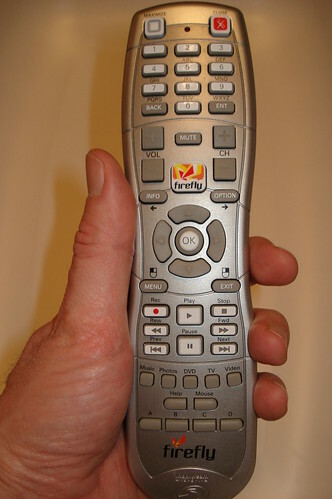 2.07" x 7.94" x 1.40"
The Firefly remote is shaped to fit the hand comfortably. 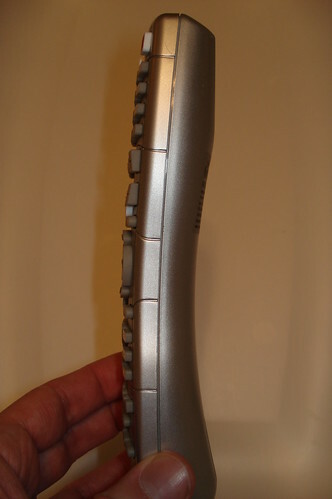 It's shaped narrow in the middle and expands towards the front and back of the remote. It's colored with metallic silver with gray and white rubber buttons that protrudes upward more than most remote control buttons do. The first thing I noticed about the Firefly is there is no IR emitter on the top or front of the remote since it's RF-based. There is an LED at the top of the remote that flashes when its transmitting to the receiver. The buttons are grey and shaped into squares that stick up from the remote more than most remotes buttons do. The center button has the trademark Firefly logo and name on it which some will find nice, but I don't really care for all that much. Many of the buttons are labeled above the buttons (not on the button) while others are labeled with black on white labels. There is no backlighting so you'll need a light on in the room to operate until you get very familiar with the layout of the buttons. 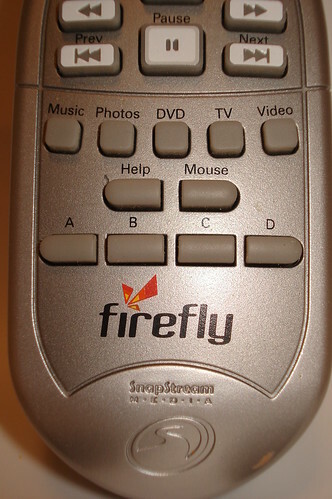 The Firefly includes 48 buttons - many of which you will not find on a traditional, universal remote control. 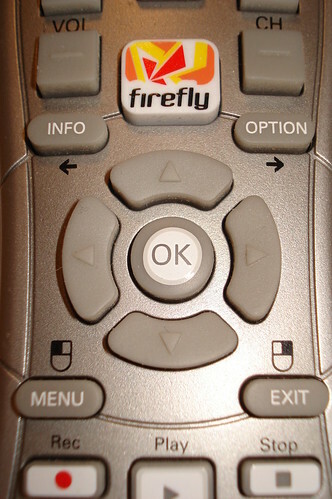 Things that expose the Firefly as the HTPC-specific remote that it is include the Maximize/Minimize Button, the Close Button, Right-click and Left-click buttons for instance. Next there is the info, option, menu and exit buttons all around the cursor control buttons in the center of the remote. 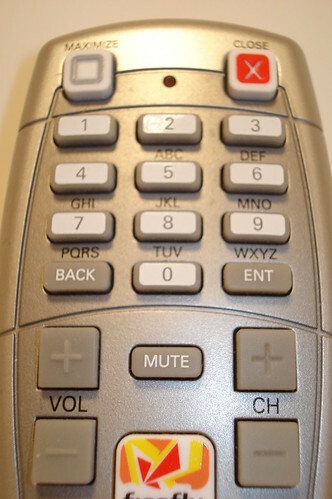 These easy-to use, 5-way menu cursor control buttons in the center of the remote have four directions and the ok button in the center. Just below the menu and exit buttons are the record, play and stop buttons. By the way, you'll notice from the photo that the menu and exit buttons can also function as the left and right mouse-click on your HTPC - something you won't find in your run-of-the-mill remote control. Finally at the bottom of the remote is the rewind, pause, fast-forward, skip back, and skip forward buttons. At the very bottom is a music, photos, dvd, tv, video, help, mouse and then the programable A, B, C and D buttons. Overall, I was happy with the button layout. The buttons I use the most are where I would expect them to be. I also liked thought the "activity" buttons such as the music, photos, dvd etc are all at the bottom of the remote since they would be used less often. Since the Firefly is an RF remote, it requires a receiver that attaches to your HTPC through the USB port. The Firefly has a black USB-attached receiver that is just over 2" wide and 3" deep. The antenna that comes out of the back of the receiver is about 6" long. The receiver has a red LED that tells you when its powered on. Install the latest firmware (1.2.1 has been the latest version for quite a while) using the included CD or download from the Snapstream website. Install using the Firefly.exe. When prompted, plug the USB RF receiver into a USB port on your HTPC. The instructions recommend you place the receiver in plain view, not covered by anything and not close to your HTPC, or AV equipment. I tried placing the receiver in various places as much as the USB cord would allow. My experience was that placing the receiver lower to the ground gave me the best reception. 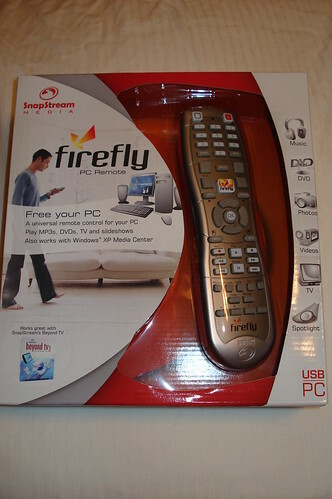 The Firefly Remote Control ships with a limited version of Snapstream's Beyond Media program which may be useful for some, but it is fairly limited in usefulness so I expect that if you don't already have a favorite HTPC software program you'll be looking for HTPC software with more functionality. You can purchase the full version of Snapstream's full-version of Beyond Media (I used to use this as my HTPC front-end) but even that program has been basically left to die on the vine so to speak as Snapstream has failed to update the software in any way (except for adding ability for it to work with Vista) for several years now. Instead, I recommend you use it with Beyond TV, SageTV, Media Portal, Media Center, GBPVR or any of the other excellent HTPC programs available. While I don't recommend you use Beyond Media Basic (or Beyond Media for that matter) Beyond Media Basic is installed with the Firefly driver and is required even if you never plan to use Beyond Media Basic. This is something that should definitely be changed with the installation. There are alternatives to using the installation software with Beyond Media Basic which I'll cover later. Once you've installed the Firefly drivers, you'll see a screen with setting that ask if you want to use Windows Media Center Edition or Beyond Media Basic as the primary media software. Then you'll see a short five screen tutorial that explains most of the functions with a description of each of Firefly's buttons. After the tutorial is complete, you can configure the receiver to recognize more than one Firefly remote, enable/disable the on-screen display (shows any time a remote button is pressed) and set the Firefly to run on PC startup. Next you can set the Beyond Media Basic "interface settings" which I didn't use. As mentioned above the Firefly controls a wide variety of media apps out of the box, including Beyond TV and it can be customized to support additional programs as well. Unfortunately, many newer versions of programs are not supported out-of-the-box. For instance the latest version of PowerDVD (7 & 8) and Quicktime weren't supported out-of the box. This meant I would have to do some searching and work to get the remote to control things the way I wanted which takes away from the easy of setup. There is a solution which involves checking out the Snapstream Forums for the user-created Firefly profiles for various programs. This was fairly easy for me, but I would expect the process to be easier for most HTPC consumers. So what do you do if you don't find a profile that does what you need it to? While it's not really mentioned much in the documentation, there are two tools that install with Firefly. ProfileEditor.exe and AppIdentifier.exe are both used to create and edit profiles and work to get your firefly working the way you want it to. This gave me the flexibility I needed, but it took quite a bit more work than I expected - even for a HTPC remote. Using the default firefly driver and software, the remote works fairly well. It can control those devices as listed in the installation, but go beyond that and it takes a bit more work. If you plan to use it with Snapstream's Beyond Media or BeyondTV it works very well indeed. Button presses provide quick response in these applications and work just as you'd expect them to. There's even a mouse mode (hit the mouse button toggle) to control the mouse on the HTPC -something nice and not often found on remote controls. With some extra work and time, I was able to configure the firefly remote control to work with non-Snapstream HTPC software such as SageTV, Media Portal and GBPVR. My main problems with the Firefly Remote Control are the fact that it cannot control your TV, your AV receiver or any other IR-based device unless you install another third party software such as girder or eventghost. It is possible, but it requires another device such as the USBUIRT and another piece of software. To me this is the biggest bummer of an otherwise excellent remote control. The one other thing I didn't like is the difficult process of finding and configuring profiles that enable the firefly to control other software programs not included in the initial install. If you like the sound of the RF-based Firefly Remote Control, but want more than the default configuration software the Snapstream provides, I recommend you check out the LM Remote KeyMap program. This software replaces the Beyond Media Basic software that comes with the Firefly and is updated regularly to handle many additional PC programs. It also handles other popular, PC remote controls as well. LM Remote allows you to easily assign a wide range of functions to all of the Firefly Remote Control buttons using it's friendly graphical interface. Launch and control many programs, keystrokes all within it's program. It's really the configuration software that should have come with the Firefly and I consider it a must-have for any Firefly Remote Control owner. The standard version of LM Remote is free, but the full version is donationware. Girder is another excellent option that with the USBUIRT can add that missing functionality of controlling your other AV components including the TV. Eventghost is another option like girder and it's even free. Eventghost - similar to girder, but free. Snapstream's Firefly Remote Control is a well thought out design that was made with HTPCs in mind. If you're willing to put in a little extra time to get it configured just right, you'll have an excellent HTPC remote control. Just know that without some extra hardware and software, you cannot control your TV or AV Receiver power and volume. 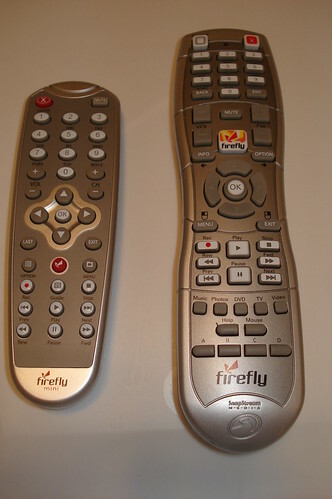 With those reservations I recommend the Firefly Remote Control for HTPC users. There are many satisfied Firefly users that you will find using Beyond TV, SageTV, MCE, Vista Media Center, GBPVR, Media Portal, MythTV, Meedios and many other popular HTPC programs. That alone proves the success of the Firefly. Thanks to Dave Zatz and Rakesh Agrawal for giving me the chance to review the Firefly Remote Control. 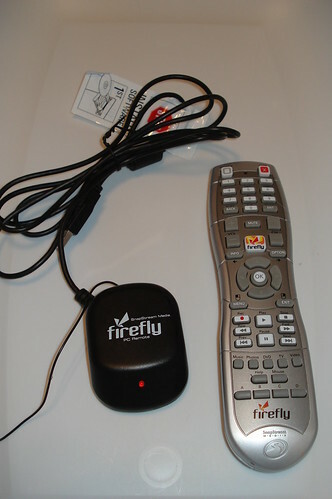 You can purchase the Firefly Remote Control from Snapstream at this website for $49.95. Snapstream also sells a mini version of the Firefly Remote Control aptly named the Firefly Mini. I'll be reviewing the mini in the next few days for comparison.